Arthur Pewty's maggot sandwich: A Private Screening. You may recall that last week the Maggot Sandwich was published somewhat earlier in the day than is normal; as I mentioned, the reason for this was that I was invited to a private screening of “Star Wars – The Force Awakens” at the CineWorld in Bexleyheath. The event was expertly organised by Maggot Sandwich reader Nav Bhamra, (whom you can see in the Rebel Alliance X-Wing fighter pilot's uniform above). I must admit that not having attended a private screening before, I was not sure quite what to expect. Of the 260 people who attended, I would say that roughly two thirds came in costume; on top of this, a number of the 501st Legion were also in attendance. The 501st Legion are a worldwide group of Star Wars fans who raise a lot of money for charity and good causes; they appear as Imperial Stormtroopers or other characters from the Star Wars universe, and attend both public and private events – they do not charge for their time, but a donation to their local charity of choice is always welcome. The 501st Legion was formed in America in 1997 by a chap called Albin Johnson. 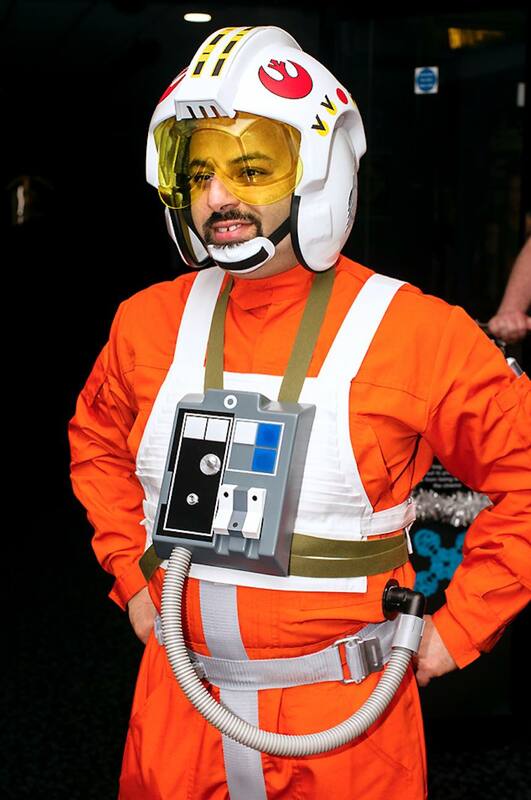 It initially began purely as a website for fans of Star Wars who had created their own costumes, but it soon grew beyond that. Within weeks of launching the sites, Johnson was fielding email requests from people across the country and around the world looking to be featured on his website in their own homemade Stormtrooper armour. What he started soon blossomed into a global phenomenon – a fan-based costuming club unlike any other. The Legion ranks swelled, and regional subdivisions called Garrisons, Squads, and Outposts were created to facilitate the organization of events and appearances on a local level. While the Legion was initially based only on the white-armoured Stormtroopers stationed aboard The Death Star, as the group expanded, it grew to encompass every other canon trooper variation, and other villains from the Star Wars saga, such as Sith Lords, and bounty hunters. Custom creations are generally not eligible for membership, and all applicants are reviewed by their local units and Legion Membership Officers prior to approval into the member database. 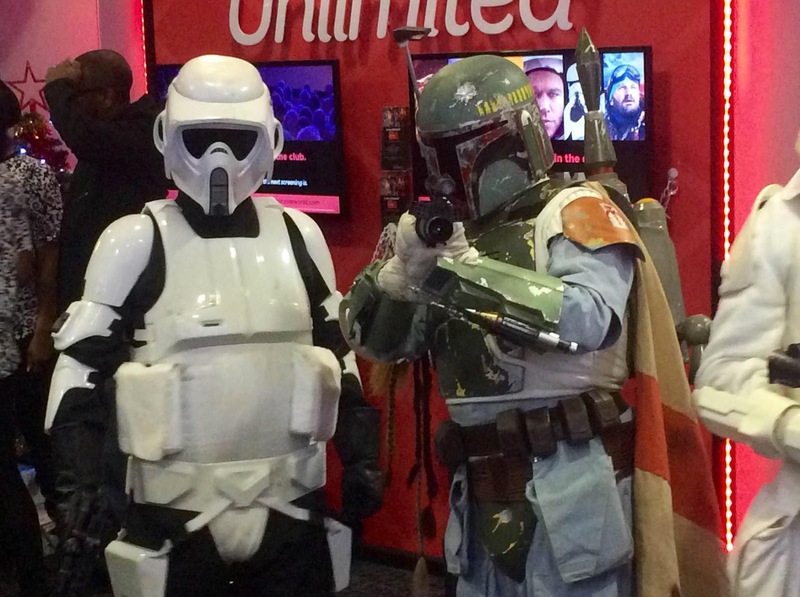 Early events attended (or "trooped") by the Legion were mostly science-fiction and comic book conventions or related to the release of the Star Wars movies in cinemas and on video. But members were looking for more frequent reasons to meet up with their new-found Legion friends and show off their costumes together. Lucasfilm / Disney have granted the Legion a limited use of their copyrighted characters, as long as members of the 501st promised never to use their costumes for personal profit, and that they represent the franchise in a positive and respectful manner. The Legion then became a force for doing good, expanding into a charitable organisation that has been likened to a Rotary or Lions Club for a modern generation. 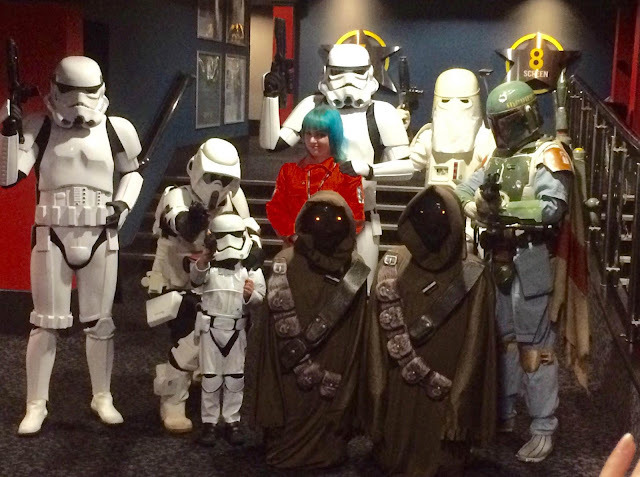 Anyway, the management and staff of Bexleyheath CineWorld pulled out all of the stops. No other films were shown on Sunday afternoon (the box office was closed) – if you were not invited to the private screening, you might as well have gone home. The place was packed, and the atmosphere was amazing. I bumped into a number of readers, and after the film, we all agreed that private screenings were likely to become a regular occurrence when any new Star Wars film is released. Thanks to Nav for inviting me along – I had a fantastic time. If you have not seen “The Force Awakens”, I can heartily recommend the film – and no, I won’t be printing any plot spoilers. The photo below shows a panoramic view of the cinema atrium, giving you a good idea of just how many people turned up for the one – off screening. Feel free to leave a comment below, or Email me at hugh.neal@gmail.com. Opposite Bexleyheath CineWorld, on the other side of the Broadway is an open piece of land, where Bexley Council offices used to be, before they relocated to the old, former Woolwich Equitable headquarters in Erith Road / Watling Street. The land was initially purchased by Tesco, who planned to construct a very large superstore on the site. Unsurprisingly (if you know anything about Tesco and their property policy) this did not happen – Tesco did their usual trick of “land banking” the site for a couple of years, until they were eventually forced to sell it on. The new owners are Sports Direct. The Bexley Times have reported that all buildings on the site have now been demolished, with the new land-owners looking to spark regeneration in the town centre. Sports Direct have claim the site will be used for a store and could generate “hundreds of jobs”. Whilst in many ways that will be a good thing, I still have a feeling that there will be plenty of strings attached. Sports Direct have absolutely appalling employment conditions, some of which may actually be illegal. The Guardian recently reported that Warehouse staff at the group, which is controlled by Britain’s 22nd richest man, are required to go through body searches at the end of each shift, for which their time is unpaid, while they also suffer harsh deductions from their wage packets for clocking in for a shift just one minute late. The practices contribute to many staff being paid an effective rate of about £6.50 an hour against the statutory rate of £6.70 – potentially saving the FTSE 100 firm millions of pounds a year at the expense of some of the poorest workers in the UK. The discovery of the low pay being received by Sports Direct workers comes on top of a string of criticisms of the working conditions within the retailer’s warehouse in Shirebrook, Derbyshire, where more than 80% of staff are on zero hours contracts. Workers are also: Harangued by tannoy for not working fast enough. Warned they will be sacked if they receive six black marks – or “strikes” over a six-month period for offences including a “period of reported sickness”; “errors”; “excessive/long toilet breaks”; “time wasting”; “excessive chatting”; “horseplay”; and “using a mobile phone in the warehouse”. Banned from wearing 802 separate clothing brands at work, and also have to go through rigorous searches – down to the last layer of clothing, asked to roll up trouser legs and show top of underwear – which typically takes fifteen minutes, because management is so concerned about potential theft. It has got so bad that school teachers in schools near the warehouse have reported that Sports Direct staff often do not come to pick up their children if they become ill during the day, as they are too frightened of being sacked for taking time off to cover the domestic emergency. Do we really want to welcome a company that has such repressive and demeaning working practices opening a store in the area? What do you think? Leave a comment below, or Email me at hugh.neal@gmail.com. Following on from the release of The Force Awakens, a relatively new type of tourism seems to be taking off in a big way. Puzzlewood in the Forest of Dean, a tranquil, moss-carpeted woodland where JRR Tolkien is said to have found the inspiration for the forests of Middle Earth, is reaping the benefits of the Star Wars phenomenon. Parts of Star Wars: The Force Awakens were shot at Puzzlewood and fans seeking an authentic Star Wars experience are flocking to the location in their droves. A week after the film hit the screens, visitor numbers are double the average. Hotels and bed and breakfasts are struggling to meet demand. For a region that has historically found it hard to create jobs, the Forest of Dean’s links to the franchise and a host of others films, notably Harry Potter and the Deathly Hallows, could prove to be a major asset. Film consultancy Olsberg estimates that “screen tourism” was worth as much as £140m to the UK last year and is likely to increase. Wye Valley and Forest of Dean Tourism, which last week launched a guide to the area for film fans, believes that screen tourism will bring in £50m to the local economy over the next five years. Areas all over the UK are being used for both film and television locations. Locally we have Chatham Historic Dockyard, which is the main location for "Call the Midwife" and was also used extensively in both Guy Ritchie directed "Sherlock Holmes" films, and the movies "Mr Turner" and "Suffragette". Even nearer home, the cast iron Victorian Gothic interior of Crossness Pumping Station has been used for many productions, including the original "Alien", Tim Burton's "Batman" the recently released "Victor Frankenstein", and once again "Sherlock Holmes". Cash-strapped local councils now understand how they can earn large sums from granting permits to film in municipal buildings and spaces. Manchester Town Hall, an impressive gothic building that bears an uncanny resemblance to the Palace of Westminster, doubled as parliament for Meryl Streep’s The Iron Lady. Its impressive stone architecture has also provided the backdrop for Victor Frankenstein, starring James McAvoy and Daniel Radcliffe, Sherlock Holmes, starring Jude Law and Robert Downey Jr, and the television series Ripper Street and Peaky Blinders. 2015 was the year when local newspaper the News Shopper moved out of Petts Wood, where it has been located since 1990. Reporters now mainly work from home – not a real problem nowadays. What has also changed (and in my opinion, for the worse) is the editorial direction of the local paper; what used to be a fairly serious journal of events occurring in South East London and North Kent has now become a bit of a cut price tabloid paper. An example of this can be seen in a recent article that reports on a mysterious noise that has been heard in Belvedere. They write:- "Mystery surrounds a "haunting animal-like howling" which plagues sleeping residents of Belvedere. Sleepy folk claim the "scary moaning" can be heard across Clydesdale Way, Norman Road and Upper Belvedere every night and into the early morning. Chloe Philpot, 25, said: "Over the past month or so I have been hearing an extremely haunting animal-like howling. "It is repetitive but each sound is never the same. "I know a few people in the area have tried to search for the source to no avail. "It's getting scary." Miss Philpot, who likened the "pitiful" screeching to a "mutant owl", took to Facebook in a bid to get to the bottom of the sound. Several people suspect the noise is being made by a fox, however, Jim Morrison puts it down to "the mutant wolf of Belvedere." The article is accompanied by a photo taken from the classic horror movie “An American Werewolf in London” – the whole thing is nothing more than a puff – piece designed to fill column inches. I have heard the “haunting animal – like howling” myself. The reason the sound is “animal – like” is because it is produced by a fox. No drama, no paranormal rubbish – just a rather loud fox marking its territory. This is a total non – story. You may recall that my coverage of the “Funky Clock Scam” got record levels of readership – coming up to 29,000 hits since the article was published; this has had some unexpected benefits. 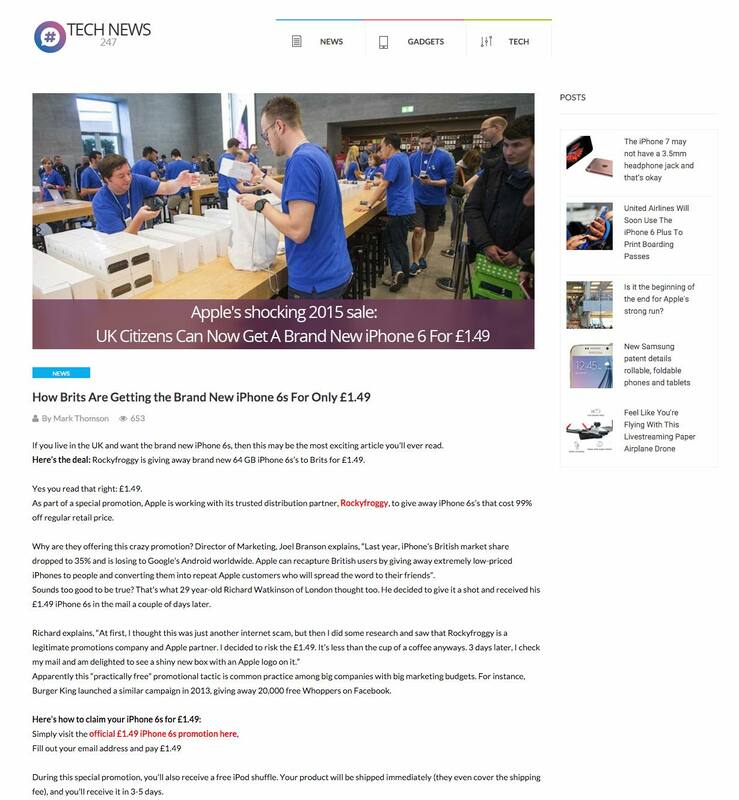 The company behind the scam have now realised that their con has been well and truly rumbled – other websites have also covered the story as well. What I have now uncovered is that certain tabloid newspaper websites, including but not limited to the Star and the Sun have been running adverts, closely created to resemble legitimate technology news websites like the one above. When one compares the text on the web page with that originally used by the Funky Clock Scam, you soon realise that the wording is almost completely identical. The only real difference is that instead of referring to “Funky Clock” the fake site refers to “Rockyfroggy” – it is the same old fraudulent scam once again, now merely with a new name. As I have stated before, if any website says that you can buy an iPhone 6S for £1.49, you can be utterly certain that it is a con. Don’t be fooled – if it looks too good to be true, then it almost always is. Did you know that the World Wide Web was twenty five years old last week? On December 20, 1990, a Fellow at CERN, Tim Berners-Lee, had been noodling around with ideas for getting hypertext documents onto public networks so that researchers around the planet could share information. He called it the World Wide Web, and he was given a NeXT workstation to develop his system. Berners-Lee – now Sir Tim – built a very basic website that had further details about his World Wide Web project plus some software for accessing it. The site is still hosted publicly here. (Although the website was built around Christmas 1990, Sir Tim didn’t hook the server up to a public network until 1991.) To call the website basic is an understatement, but it did spread the word about the WWW's protocols. Crucially, the project's designs were published openly along with the source code for servers and browsers, allowing anyone to set up on the web without having to pay a penny in royalties or licenses. It's probable that this was the biggest boost to mankind's ability to share information since the invention of moveable type. Now there are websites for everything and anything. Sir Tim freely admits that he did not get everything right at the start; Sir Tim was also focused on text; the initial proposal states: "Where facilities already exist, we aim to allow graphics interchange, but in this project, we concentrate on the universal readership for text, rather than on graphics." Marc Andreessen told The Register website that Sir Tim called him while Andreessen was developing the Mosaic web browser, and castigated him for supporting images in the program – saying that adding more than words at this stage was pointless. Security, or rather the lack of it in the original HTTP standard, is another area that Sir Tim admits to getting wrong. Now he'd like to see all web traffic and email encrypted, although he acknowledges that there are times when investigators legitimately need access to encrypted data for criminal prosecutions. Sir Tim has been steering the development of the web since its inception, and has drawn flak from all sides for some of his views. He supports the adding of anti-piracy mechanisms, aka DRM (Digital Rights Management), to HTML5, saying it is needed for high-value content, and some companies wish he would stop defending net neutrality so vociferously. I actually encountered Sir Tim almost by accident four years ago. I attended a meeting at The Royal Society in Carlton House Terrace, London. As I came out from the meeting room and headed into the reception area, I noticed a tall figure waiting close to the main entrance; he was wearing a long and rather impressive drover style coat. I recognised him, but could not recall his name. I then realised that there was a life - sized portrait of the same person on the wall, right next to where he was standing in real life. The penny then dropped. I must admit that I was tempted to go up to him and say hello, but fearing I would only make myself look like an idiot, I thought better of it and left the great man alone. The advert above, for Erith - manufactured Burndept radio receivers was taken from the very first Christmas edition of the Radio Times, from back in 1923, the cover of which you can also see above - click on either picture for a larger image. Back then it was all very different to today's multi-channel, on-demand world. There was only radio, and London station 2LO had a meagre five-and-a-half hours of programmes on Christmas Day. But to some extent, the first Christmas Radio Times issue set many traditions which have prevailed for decades in various guises. The cover was a warm splash of colour and very festive in tone, while the publication's austere masthead was festooned with snow and holly. John Reith, who went on to become the BBC's first director general, was given the first page to deliver a message to listeners, in which he deliberated the meaning of Christmas and then inevitably talked about the joy of broadcasting and the "first Wireless Christmas". "The loud speaker is such a convenient entertainer," he wrote. "He doesn't feel hurt if a cracker is pulled in the middle of a song, or offended if the fun grows riotous during his performance". 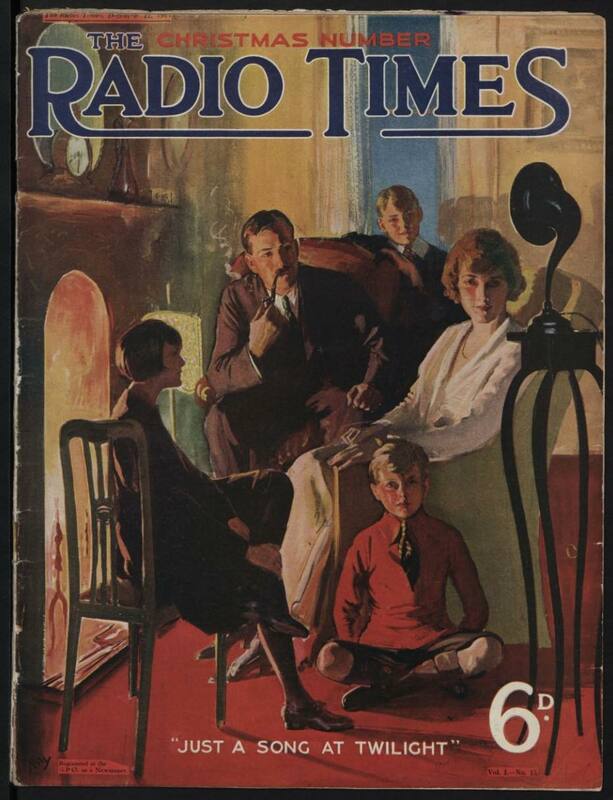 While Reith was keen to talk up the virtues of broadcasting, the magazine was packed with adverts for radio sets and cartoons about the joys of consuming radio programmes. Considering the BBC had already got a reputation as a rather austere, straight - laced organisation, the original 1923 Radio Times makes for quite an easy read. 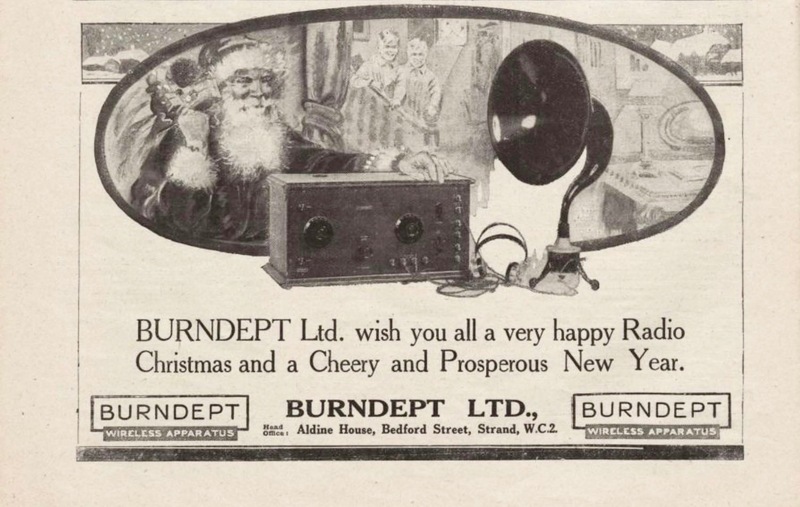 You can download a free PDF copy of the 1923 Christmas Radio Times by clicking here; it makes for fascinating reading. Many readers may be able to take part or all of the Christmas as a holiday break. I had one reader drop me a line, knowing my interest in radio, asking about something different for her to listen to. Initially I recommended my old station, Radio Caroline, who broadcast 24/7 online - you can listen to them by clicking here. Another station I personally spend a lot of my free time listening to is Radio Seagull - a radio station that was started back in the 1970's as Caroline's album - based overnight service. Nowadays Radio Seagull broadcasts live via DAB+ in the Netherlands, and worldwide online from a converted light ship - the Jenni Baynton which is (legally) moored in Harlingham Harbour in the Netherlands. The station is run by volunteers, and plays a lot of music that you simply don't hear on other radio stations. The Daily Telegraph said of the station "As if to prove that the spirit of Sixties-style pirate broadcasting never really died, this charming music station broadcasts from a ship moored in Harlingen Harbour in the Netherlands. Prog rock is the predominant flavour, with plenty of Genesis, Pink Floyd and the like; but genres as diverse as UK blues, world music and jazz also get a look in." You can visit the Radio Seagull website here. Something that seems to have startled the property journalists at the London Evening Standard, but which I feel will be of much less surprise to local people is the news that Old Bexley village has emerged as the hottest property market in Greater London. The well-kept secret emerged in new research, by Savills, which examined the price performance street by street within London’s best performing boroughs of the last twelve months. Hillingdon, Enfield, Bexley, Newham, Greenwich and Barking and Dagenham have all seen price growth of between 12 and 13 per cent – but within these boroughs are pockets of dramatic outperformance led by Old Bexley (sometimes known as St Mary’s) which saw property prices grow a resounding 31 per cent to an average price of £423,383. It is not really surprising, the village is very close to the A2 into London, or down to the South Coast. It has numerous bars and restaurants, and some very good pubs too. The only real fly in the ointment is the disruption being caused by the well - overdue work to improve the railway bridge in Bexley High Street, which is going to cause local traffic disruption for goodness knows how long. Personally I would not like to live in Bexley Village, as the constant day and night traffic flow, and the subsequent noise would drive me to distraction. It is a pretty town, which has good resources, but even if it was not out of my budget, it just does not tick enough boxes for me. Just for once we have a deserving Christmas number one single. As pretty much the whole country knows, the Lewisham and Greenwich NHS Choir charity single "Bridge over You" topped the Christmas chart. If the video of the single below looks familiar, much of it was shot in and around the Queen Elizabeth Hospital in Woolwich. I have to declare an interest; one of the charities that will benefit from the money raised by the NHS Choir is Carers UK, with whom I have a close association as part of my "day job". Give the video a watch below and let me know what you think. Not sure "the Beast Of Belvedere" is a fox, I've heard it where I live halfway down Picardy Road, in the village, West St and Streamway. Can't believe there are various animals all making the same slightly odd "howl". Never heard foxes make it before. Wonder if it's something to do with drilling at Crossrail?